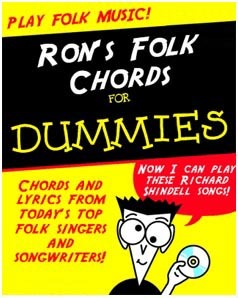 Welcome to Ron's Folk Chords, a site that I hope will be helpful for beginning and accomplished guitar players alike. What it is, basically, is a collection of transcriptions I've worked out for songs by some of folk music's finest singers and songwriters. Please note: the actual transcriptions have not been "officially" blessed by the songwriters themselves, so the only vouching I can do for their accuracy is to tell you that I've tried hard to get them right. I've got this little internal policy that I won't post a song unless it's at least 95% accurate, so let that be your guide. However, I'm happy to say that most of the artists are aware of the site, several have specifically given me permission to post their songs, and many of them actually recommend the site when people ask them for chords to their songs. In fact, several of them link here directly from their own websites, so I take that as a certain measure of validation. If you have any questions, comments or recommendations, click here to email me.